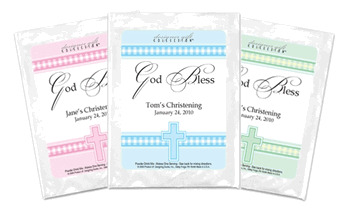 Your family and guests will certainly enjoy a cup of this creamy mocha cappuccino or delicious hot cocoa mix at your next Baptism, Christening or other religious event. Each single serving of drink mix comes sealed in a beautiful white gloss pouch (4"w x 5.5"h) that contains 1.25 ounces of the powdered mixture. Instructions are on the back on how to mix the pouch contents to create an irresistible indulgence.